Catalign Innovation Consulting: Why does Edgar Schein say, “A culture of innovation doesn’t scale up”? Why does Edgar Schein say, “A culture of innovation doesn’t scale up”? 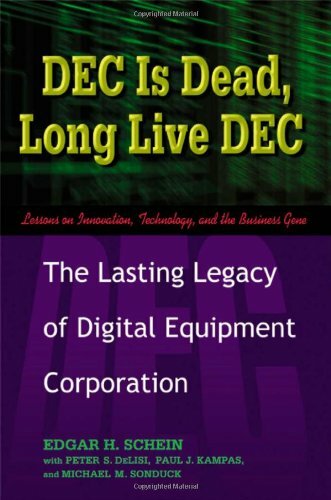 “DEC is dead, long live DEC” by Prof. Edgar Schein is a forty year saga of the rise and fall of an innovative organization – Digital Equipment Corporation (DEC) – seen primarily through a “culture” goggle. Founded in 1957 DEC grew to become the number two computer company in the US with $14 billion in sales at its peak in late 1980s and from there on waned over a decade and got sold to Compaq in 1997. Schein, an authority on corporate culture, draws 15 lessons towards the end of the book. According to him, the most powerful lesson is, “A culture of innovation doesn’t scale up”. What does Schein mean by “culture of innovation”? And why does he say it doesn’t scale up? Let’s explore these questions in this article. To understand some of the tenets of DEC culture, let’s look at two stories from the book. The first episode occurs in 1967 when Schein participated in an Operations Committee offsite at a hotel on Cape Cod. The committee decided to review all the projects that were under way in the various parts of DEC. The presenter was Ted Johnson, who stood at the blackboard and wrote down the list of projects he knew to which others contributed. The list grew to some thirty fascinating projects. Schein’s curiosity began to be aroused as to how the group would now set priorities and make decisions about where to allocate resources and effort. CEO Ken Olson was very quiet and seemingly uninvolved. The group took a long look at the list and nodded approval and then went on to the next item on the agenda! In action was an underlying belief of internal competition and “Let the market decide”. The second story unfolds in 1980 at the beginning of PC revolution. Ken Olson, an engineer at heart, is said to have described IBM PC as “a piece of junk” and so DEC was set out to produce a more elegant product. Operations Committee approved three PC projects, Professional, Rainbow and DECMATE. The market was not interested in a proprietary PC and hence rejected all three. Following the debacle the engineers at DEC wrote a proposal in 1984 for a PC clone. It was called DEC PC25 and 50 proposal. Compaq was just being founded. Ken killed the project – DEC is not a copycat. Underlying tenet was “DEC defines the product spec, neither market nor IBM”. If Schein’s claim were true, IBM (Rev: $100B), P&G ($80B), 3M ($23B) & Google ($23B) shouldn’t be innovative. A G Lafley’s claim that P&G built repeatable and scalable process of innovation should be false. Perhaps Schein doesn’t mean this to be a sweeping generalization. In fact, Shein does advocate the role of leaders as “change agents” in this article “Leadership and organizational culture”. However, it is not clear how many organizations are serious about developing change agents. For that matter, how many CEOs consider themselves as change agents?